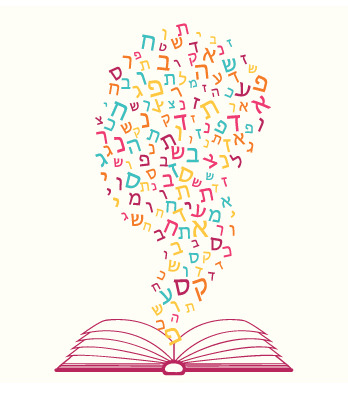 Can you make yourself understood in Modern Hebrew (Ivrit)? Want to improve your Ivrit conversation and proficiency? We are an intermediate-level, fun and friendly conversation group (chug) in Ivrit for people who can speak the language and want to progress their competence..
Great majority of discussion in Ivrit. At each meeting, we mainly read, translate and discuss articles from the latest issue of Yanshuf (an Israeli newspaper in somewhat easier Ivrit) with its crib sheet or just chat with each other in Ivrit. Except when translating, we speak only in Ivrit throughout our meetings. Before each meeting you will receive an email with material from the current issue of Yanshuf. For more information or to join, please contact Tony Korn on 07958 334 665 or click here to email. 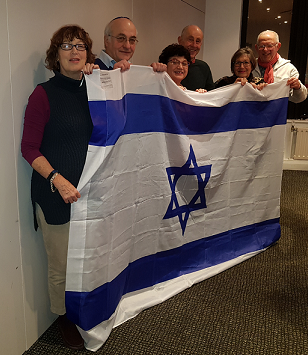 Monday’s evening Chug Ivrit class along with the Israeli flag that they have donated to Kinloss.